Product #21376 | SKU 2256 | 0.0 (no ratings yet) Thanks for your rating! For the simplest plug and play functionality, MOTU's FastLane USB 2 x 2 MIDI interface for the Mac and PC is hard to beat. A unique advantage at this price point is the ability to still function when the host computer is switched off - which means musical ideas can be worked on without having to wait for the computer to power up. 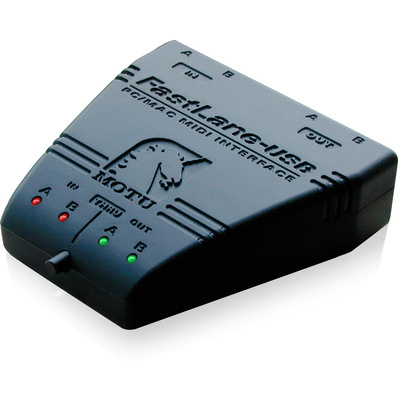 The FastLane USB takes full advantage of the USB architecture, providing increased MIDI throughput, better timing accuracy, support for "hot-swapping" and plug-and-play expansion. When the need arises for more ins and outs, it is simply a matter of adding more units or even other fully featured multi-port USB interfaces.